In the classic example to explain chaos theory, a butterfly flaps its wings in Brazil and ultimately causes a tornado in Texas. My story, however, is not really about butterflies. It is about bullets, drugs, and blood. A butterfly flaps its wings. In this instance, our “butterfly” does not simply flap its wings, but instead, it walks into a gun fair in Florida and buys an assault rifle. Weeks later, that same gun fires a bullet that kills yet another person in Rio de Janeiro. It should not be. 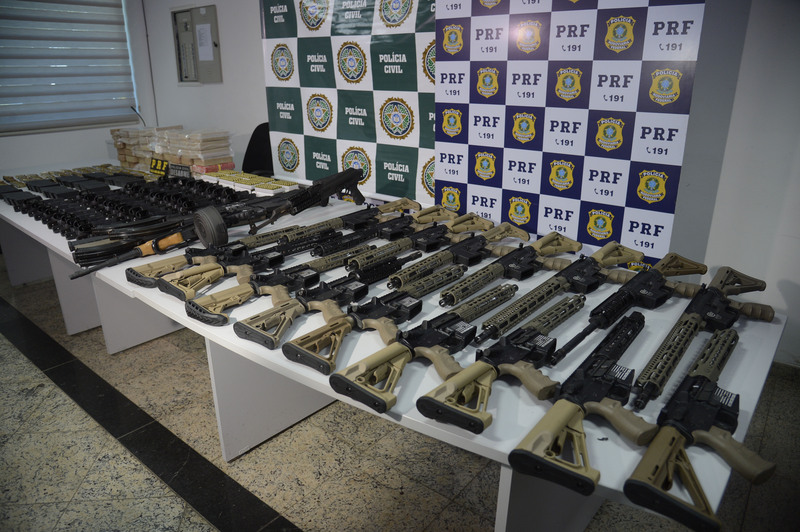 According to a report by the Federal Police of Brazil, the US is the biggest source of high-caliber weapons for Brazilian organized crime, and this has been an issue since the 1990s. Brazil is also not the only place where our gun-buying butterfly can cause a “tornado” of blood and bullets: most of the guns used by Mexican cartels also come from the United States, and in the regions of Central America, North America and the Caribbean, every half an hour a US gun is used to commit a crime. In practice, this all means that US domestic gun laws are not in fact purely domestic concerns. These laws do not only concern Americans’ 2nd Amendment rights. Lax gun laws effectively export violence to other countries, and as such concern them as well. Marches such as the March for Our Lives, earlier this year, though sparked by domestic school shootings, are also about the lives of people elsewhere in the world, lost to US-made bullets. Our “butterfly” does not simply flap its wings, but instead, it encourages farmers to plant more coca leaves in the Andes. Months later, a white powder leads to yet another overdose in a US city. This butterfly effect is probably less surprising than the first one, since Pablo Escobar is quite famous. In any case, I believe it is important to talk about it, considering how cocaine production had declined in Colombia but has now reached record highs. In the chain of events set off by this coca-planting butterfly, not only is the US affected, but also all the transit countries of Central America, such as Guatemala, where almost half of all murders are connected to drug trafficking. Once more, this shows that domestic decisions cannot be considered in isolation and can have significant negative spillover effects for other countries. While allowing for legal coca production for indigenous populations, as was done in Bolivia, is important, states must be proactive in curbing efforts by criminal organizations to subvert such programs and take advantage of farmers, as the FARC allegedly did. Our “butterfly” does not simply flap its wings, but instead, it deports Salvadoran gang members back to their civil-war-torn country. Years later, MS-13 is a transnational gang spreading terror through Central America and the US alike. This last butterfly effect is not as straightforward as the other two, and in fact involves many butterflies flapping its wings over the years to create a very powerful and very deadly tornado. During the Cold War, the US government backed a right-wing military government in El Salvador, which led to a northbound refugee flow that was not recognized as such, which in turn meant that many individuals were deported back. In the interim, they had joined gangs for protections, such as MS-13, so they were not the only thing the US sent back: crime followed. Now, the Trump administration wants to deport even more MS-13 members back to Central America, insisting on a decade-long policy that has clearly failed. Once more, there is a lot of concern for domestic consequences, and little worry about potential negative effects for other countries. It seems like an “out of sight, out of mind” mentality has taken over in the times of America First. That, however, will never work, for the same reason Brazil First or El Salvador First would not. Organized crime is clearly transnational, and criminal organizations are taking advantage of our globalized world. A butterfly flaps its wings and they pay attention, and contribute to the bloody tornado it will cause sometime down the line. Governments, on the other hand, are very concerned about the tornadoes in their territory, and are ignoring the butterflies, closed off in a bubble of short-sighted domestic concern. This needs to change. The only way of effectively dealing with crime and violence is by cooperating with one another, and paying attention to the butterflies.